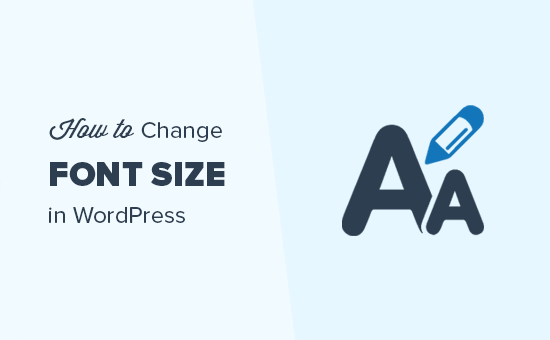 How about changing font size in comments to blog posts? Thanks for the TinyMCE plugin suggestion for this. Super simple and it works great. I appreciate it! You may also want to subscribe to our YouTube Channel for WordPress video tutorials. I too, would like to learn how to change font size in the style sheet. Thank GOD I found this article! Thank you very much for a great tutorial. Very soothing voice that’s clear and easy to understand, too. I appreciate you! Unfortunately, this is only available to paid accounts. If you’re using WordPress.com, there is no Plugins tab located in the Dashboard. Actually, it’s only available to WordPress.org accounts, which is not the same as a paid WordPress.com account. Anytime you see “WordPress” without a .com at the end, it’s safe to assume it’s referring to the self-hosted .org, which WPBeginner tips & tutorials are aimed at. I know it can be confusing for people who use .com, but the two really are very different animals. When looking for help, you’ll get better results if you’re sure to include “wordpress.com” in your search terms. I have tried to download TinyMCE several times without success. When I try to open the files. everything appears to be written in Arabic (characters look like that!) Any other suggestions as I’m new to WordPress and would love to get my website up and running. Thank you! NO Thanks for NOT publishing my comment. I did see in another comment that I cannot use TinyMCE or plug ins on WordPress.org. I’m still not sure about paragraph headings, though. I have that button, but I didn’t seem to be able to get it to give a dropdown menu or anything. One main reason I got frustrated with WP was that I couldn’t seem to change font size and the text of my blog always seemed too small. Thank you so much for the tutorial! I was able to change the font size in my posts…. but I cannot figure out how to change the font for the widgets in my sidebar… any suggestions? Please see our guide on how to add custom styles to WordPress widgets. I sure wish someone could explain how we can change the post title font size without the change affecting the Recent Posts widget. I am using the basic Twelve Thirteen. It offers advanced Post Title font changes with a link found directly under the title. But totally useless, since any changes equally affect the Recent Posts box! What about changing the font size of the Title….when I try to do this, the Recent Posts in the sidebar increases in size and looks terrible. No way is offered to resolve this anywhere that I can find…and I’ve been looking for hours. But unless I reduce the title size, the default size is so large it takes up half the opening page. Are these option, including the plugin font size options not available if you host your own site or something? I did everything everybody says to do, dragging the font size button to the bar etc., and I get no option to resize fonts no matter what. I also have no “paragraph” menu. We have updated the article with new instructions. Hope this resolves the issue. Thanks for notifying us. how can I change the font of a specific title page without affecting the title on the rest of the pages? I installed the plug-in from the link on this page and installed and activated it. I opened the second menu with the last button on the first row but it looks the same as before I installed it. I tried deactivating and reactivating several times but the option to change the font is still not there. A new row at the top (I think it’s new, anyway) appeared with “file”, “edit”, “insert”, etc. right above what used to be the first row. Your video was very helpful. I already found and changed the size of the one font my WordPress Theme gives me, but it’s a beginning. I will download your suggested Plugin. Great short video. This helped a lot…. Thanks!!!…. Tip for others… Please make sure that when you “Go To Settings” and you see the “TinyMCE Advanced” text in the drop down Menu… Remember to configure your Toolbar with the Font Size etc otherwise you will not have it in your toolbar as the toolbar has much more options and the Font Size is not an automatic part of your new toolbar… So simple with the drag-and-drop to configure…. Thanks again for the great share and taking time to help other people!!! Please report in the plugin’s support forum and attach a screenshot of your post editor. hii mod ‘ update your post and add a extra line about this problem solution ‘ i had replied it on juna id comment’ i will be glad if you do it ‘ Thanks by d way ! Thanks for this article. One of my biggest pains about posting on WP is resolved forever! I have not ever seen those toolbars. I wonder if ANYONE would actually ask this question if they’d have those menus right under their noses! I am having a weird issue. I set my main points to H2 tags and they were showing up but when I tried to switch them to H1 to make them larger they weren’t showing up. Anyone have any insight? I found your video really helpful. 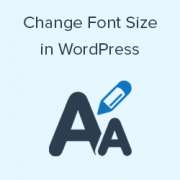 Can you insert plugins tp change font size on wordpress.com or only wordpress.org. I need to change font size under photo’s on wordpress.com. I want to change font of my headings and other items apart from posts. I have tried to amend css style sheet but I am lost because nothing happens and I have never used it before as well. Tine MCE only helps with post sizes but what about other things on website? Downloaded and activated this plug-in, but as a couple of users mentioned earlier, it doesn’t include the option to change the font size. All of my options are the same as the picture you provided with the exception of the Font Size. In place of it, I have Styles. Your picture is very misleading. How is ‘jumping to conclusions without exploring a plugin’ working for you? Please don’t be a moron when someone takes the pain of creating an entire article explaining stuff. You posted this 3 months ago and your question was answered by the admin below a comment posted 1 month prior to that. My add/edit post window does not have the entire second line of options that you have pictured in this tutorial. This means that I don’t have the paragraph tab in which to change font size. Any advice? The second line of buttons appears when you click on the last button in the first row, its called show/hide kitchen sink button. Clicking on it will display another row of buttons in your visual post editor. Thank you, thank you, thank you! I appreciate the article…very helpful! 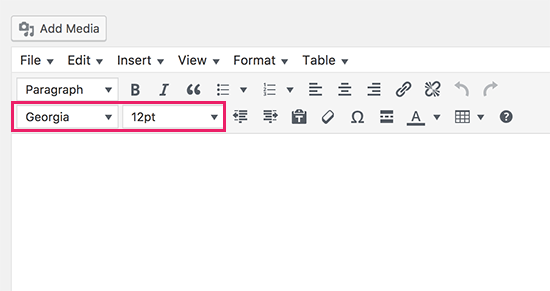 Can you adjust the spacing between paragraphs in WordPress ? Yes, but you would have to edit the theme’s CSS. Don’t forget to click the “Show/Hide The Kitchen Sink” button in the visual editor to display the paragraph setting. It’s hidden by default. Where can I find this button? My visual text editor doesn’t have a paragraph option; basically it only has the top row of options from the screen shot. Thanks! You guys are great and thank you for info! Another way is to use a theme framework like Thesis, and I suppose Genesis or Headway and the like(I use Thesis, so it’s what I’m familiar with). You have a dashboard to easily change anything you like anywhere, such as font size in specific locations. Can I know how to change default font size ? You would need to edit the style.css file and change the font size on your body element. so please explain how you change the default font by changing the style.css?? How do you give the user an option to change the font size and elements (if they have bad eyesight, etc.) Here is an example: drwalisever. com. In the top right corner there are 2 buttons. It uses the Fusion theme, which is no longer developed. A tutorial would be great, thanks! But I think will effect in SEO, as there are no option for Heading tags are being shown.. is it so? 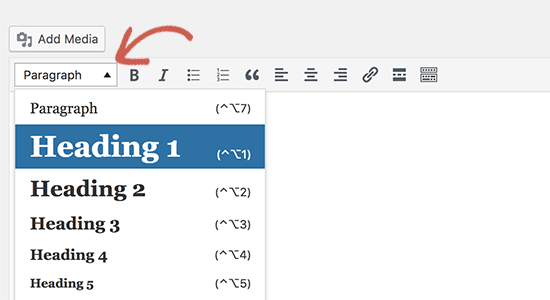 The heading tag options only show up in the visual editor. If you are in the HTML editor, it will not show.